Tap into the tremendous resources of America's oldest research university with a Master of Science in Health Care Management. And get a hands-on understanding of the analytical, economic, political, and technological perspectives of a fast-changing and complex health care landscape. Institutions: regulators, civil service, civil society, advocacy groups, foundations, and funders. This is the only business school degree program in the world that can harness the resources, reputation, and experience of Johns Hopkins University and its top-ranked schools of Medicine, Nursing, and Public Health. The MS in Health Care Management program provides students with the most relevant business skills to be effective and efficient leaders who will improve the quality and access to health care at appropriate cost in light of the regulatory, cultural, and ethical context of the relevant health care ecosystem. The 36-credit MS in Health Care Management full-time program option is ideal for those new to the industry or with less than two years’ experience. Designed to be completed in one year, the program is offered at the Carey Business School’s flagship Baltimore campus. Descriptions for the following courses can be found by using the JHU Student Information System Course Search. In addition to the elective courses listed above, MS in Health Care Management students can select up to 2 non-health care courses (maximum 4 credits) as part of the 10 elective credits. These courses must be approved by the Academic Program Director. Students should contact their advisor for more information. The 36-credit MS in Health Care Management part-time program option is ideal for working professionals with at least two years of experience. With classes held on evenings and Saturdays at Carey Business School’s Baltimore campus and online, the part-time format allows students to pursue a graduate degree without interrupting their career. Students applying for the online part-time program should review the technical requirements for online students. Online courses feature mostly asynchronous learning activities with a few recommended or required synchronous (real-time) activities. Students enrolled in the online MS in Health Care Management program will be required to take one course with residency, which includes a two-and-a-half-day onsite component, to complete their degree. This onsite residency is held at the Carey Business School’s Harbor East campus in Baltimore, MD. The curriculum includes the following courses. Students should consult with their academic advisor as course sequence and availability may vary. Learn more about the financial assistance available to students. Discover all you need to get started with your Carey application. Visit our How to Apply page to learn more about the process, requirements, and more. o	Official transcripts from all U.S. schools must be sent electronically. All U.S. transcripts must be from an accredited institution recognized by the U.S. Department of Education. Please visit your school’s website to request an official transcript and be sent electronically to carey.admissions@jhu.edu Please note that transcripts are required from all schools where 15 or more transfer credits were earned. Final transcripts must show the degrees you have earned. An admission decision may be delayed if you do not send transcripts from all colleges/universities attended. GMAT/GRE scores - requirement varies by program. TOEFL or IELTS scores for non-native English speakers. A waiver request form can be found on the online application. For more information, please contact us at carey.admissions@jhu.edu or 410-234-9220. Find more information about our program deadlines. Our Career Development team is committed to providing opportunities for you to build professional skills and competencies that are essential for success in the career search. The most recent MS in Health Care Management career data is available here. 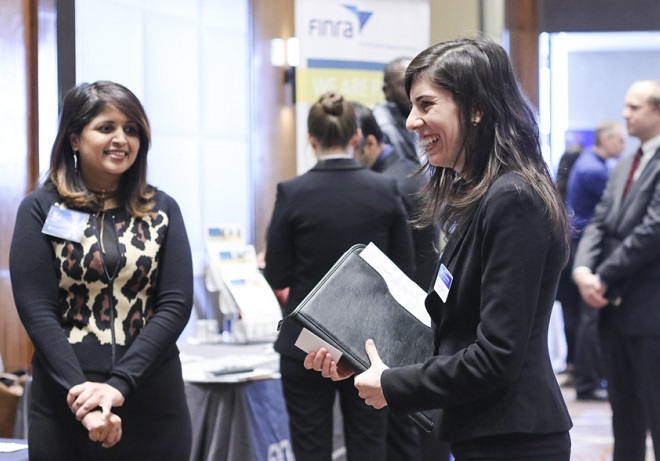 More than 350 graduate business students and 41 outside employers attended the third annual Carey Business School Career Fair on Feb. 17. The event was organized by Carey’s Career Development office so students could connect to employers from a variety of industries.